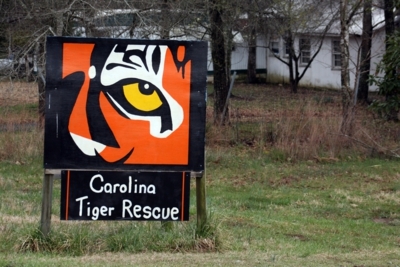 When my sister was in town a few weeks ago, we decided, at long last, to check out the Carolina Tiger Rescue. 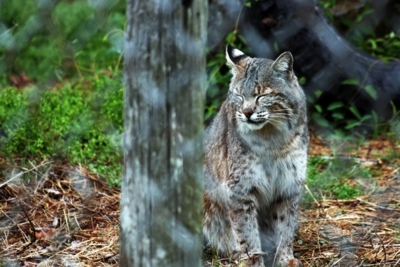 Formerly called the Carnivore Preservation Trust, the Carolina Tiger Rescue takes in carnivores in need of a home, whether due to zoo closings or because a well-meaning person learned that keeping one for a pet really wasn’t a bright idea. 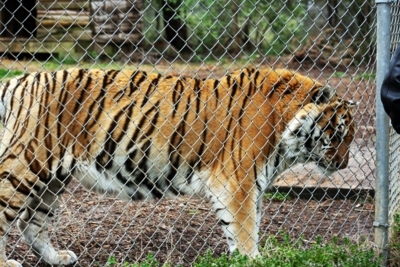 Did you know that it’s legal to own a tiger in NC? That’s just crazy, and was one of the first things we were told by our tour guidePublic tours ($14) are held on the weekends, but you have to RSVP ahead of time—I’d recommend calling a month before you’d like to go. 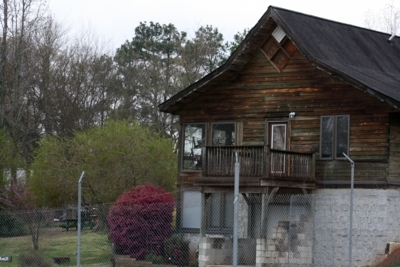 If you have a group of 15 or more, you can also arrange for a private tour. You meet up with your tour guide inside the visitor’s cabin. 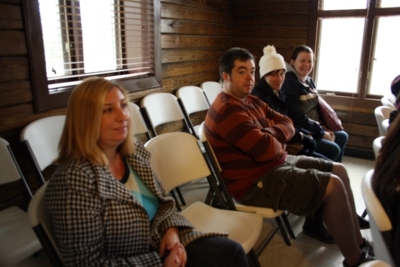 My sister, Christa, then Ben and friends Laura and Ellen. Then it’s on your way to see the animals they have. This is no quick tour—it took us about 2 hours all in all. And it was freezing cold that day, too! We were troopers and enjoyed a fire back at our place afterwards. After the initial information dump, we set out. 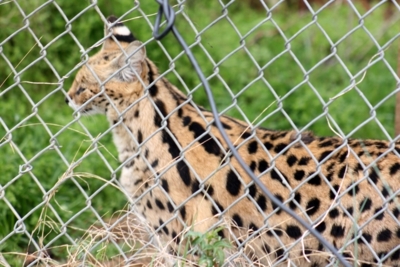 The animals were separated from us by loose chain link fences so the cats realize the fences aren’t stable enough to climb and don’t attempt it. Our tour guides gave a lot of information about the animals, their back stories, and fun tales like that of Raj, the tiger who’s a pro at spraying tour groups. 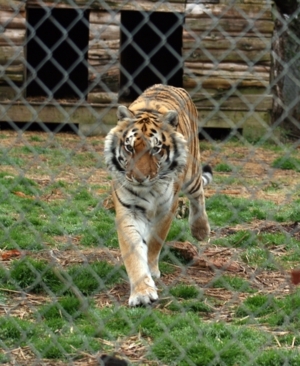 We learned that if a tiger aims your way, take three large steps to the left, and you should be out of the line of fire. We practiced that maneuver several times while visiting Raj. 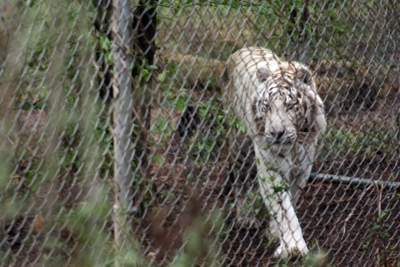 We also heard our first chuffing at Raj’s enclosure. It’s a noise somewhat like a blustering horse that tigers make to greet each other. 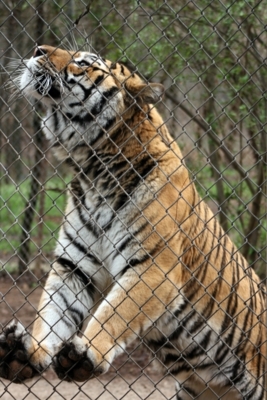 Each volunteer learns to chuff and says hello to the tigers by doing so. 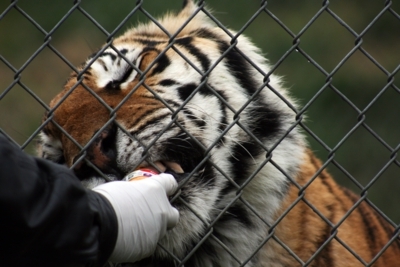 The tigers can actually distinguish between each volunteer’s chuff. I thought the chuffing was pretty adorable. 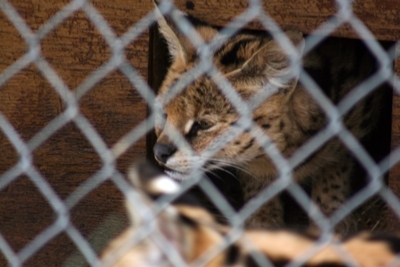 After meeting Raj, we moved down toward the servals, who were happy to come out in the cold once they realized treats were involved. I believe this was Santana, but I’m unsure. 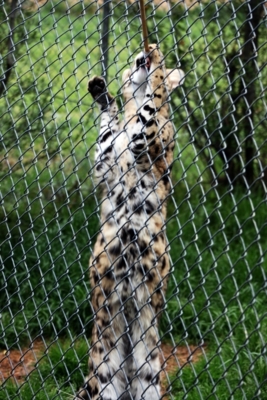 The serval reaching for a treat. 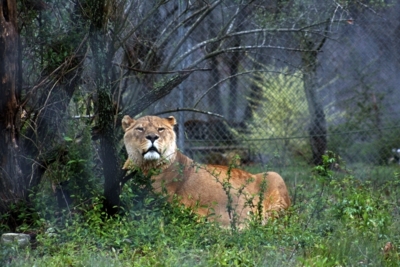 We also passed by the caracals and lynxes, all of which refused to come out in the cold. 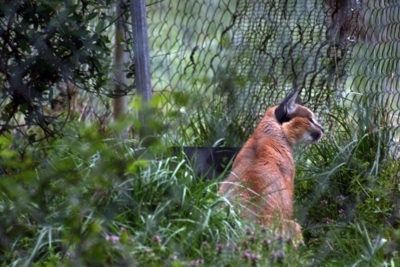 I did snap a picture of a caracal from the other side of the rescue as we neared the end of the tour, though. They are gorgeous animals. Aren’t all cats, though? 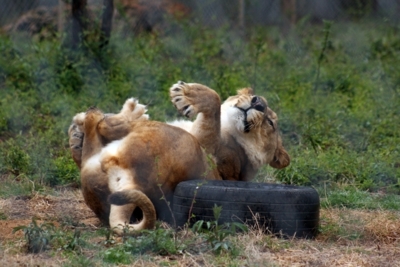 A trio of lions was next on the agenda, and they were a playful bunch! Well, playful with each other. 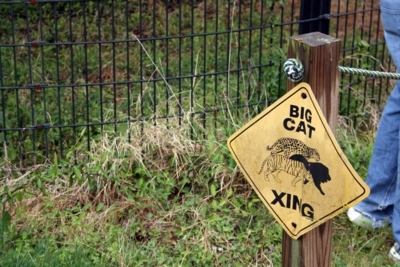 Apparently these cats are high on the aggression scale, so no humans go in to see them at all. 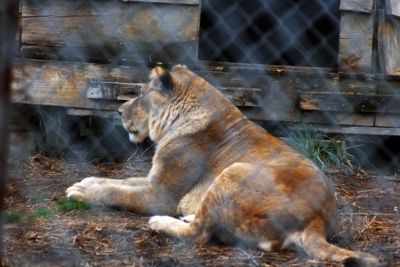 A male lion—no mane because he was neutered, so he never grew one. 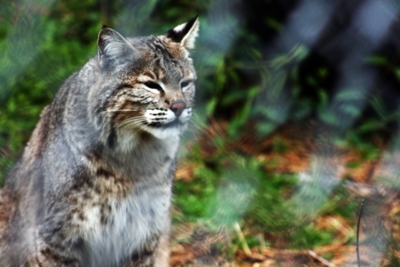 We then passed by a beautiful bobcat. After moving on from the bobcat, I noticed something strange in the trees. 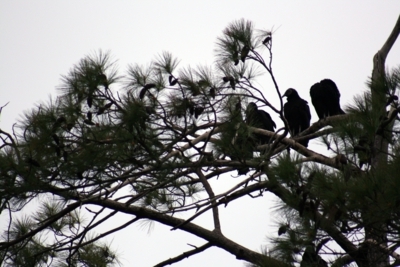 Buzzards! They live all over the rescue and swoop down to eat anything the cats decide to discard. Occasionally, this does result in an eaten bird instead of a full one! Next up were the binturongs, which strangely smell like corn chips. They look stranger than they smell. 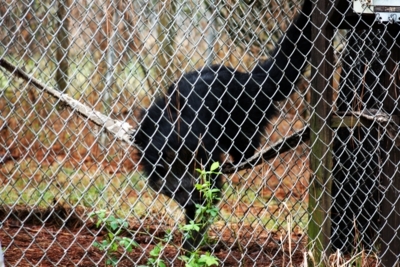 I’d never seen a binturong before! 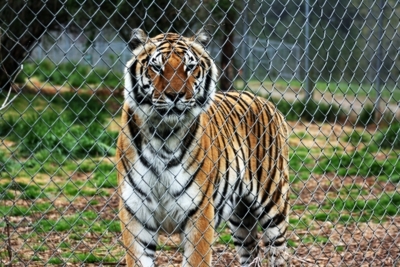 According to our tour guide, they are pretty friendly as far as carnivores go. 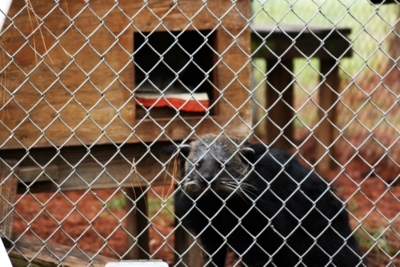 After the binturongs entertained us, we headed over to more tigers, meeting Nitro, a blind one. Nitro finds his chicken by narrowing down the area. 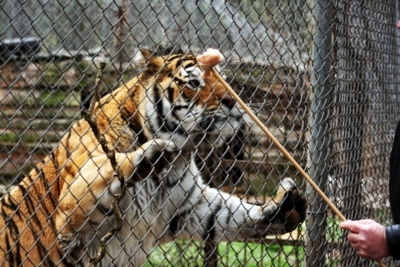 He’s a super friendly tiger, even with his disability. He posed for us for quite a while. 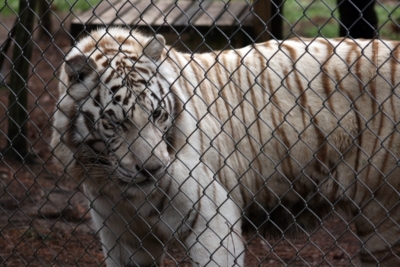 Next door to Nitro is a white tiger named Jellybean who also gave us the courtesy of prolonged picture time. 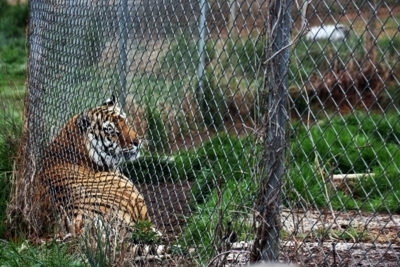 We moved on to our last tigers, a mated pair named Carmelita and Lucky. Lucky, licking a baby food jar clean—he loves the stuff! 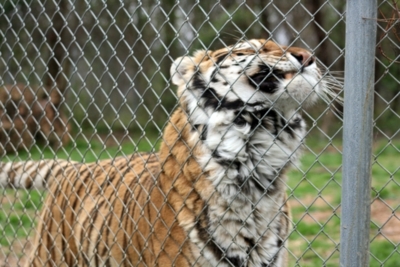 Money from the tours is the Carolina Tiger Rescue’s primary source of income, so if you’re intrigued by what you see, head on out and support this awesome group. How long did you say the tour was and what time did you go? It took about 2 hours. We ended up on a 2 pm tour–I believe they usually offer tours at 10 am and 1 pm on the weekends and add on an extra one if they have the staff for it. Again, though, you HAVE to RSVP ahead of time with them–if they think they have enough people to add one on based on RSVPs, then they probably will. Pingback: The Gourmez » Blog Archive » Black Tie and Tail Ball Reminder!